In early August 2013 Assamo stayed very close to Adigala. Although I have never been there, given the pattern of locations I'd guess the abattoir is on the western edge of town (Look back at the previous post). Can anyone who has been to Adigala tell me where the abattoir is located? Or can someone tell me what might be so attractive to this vulture out on what I think is called "Mosque Road"? 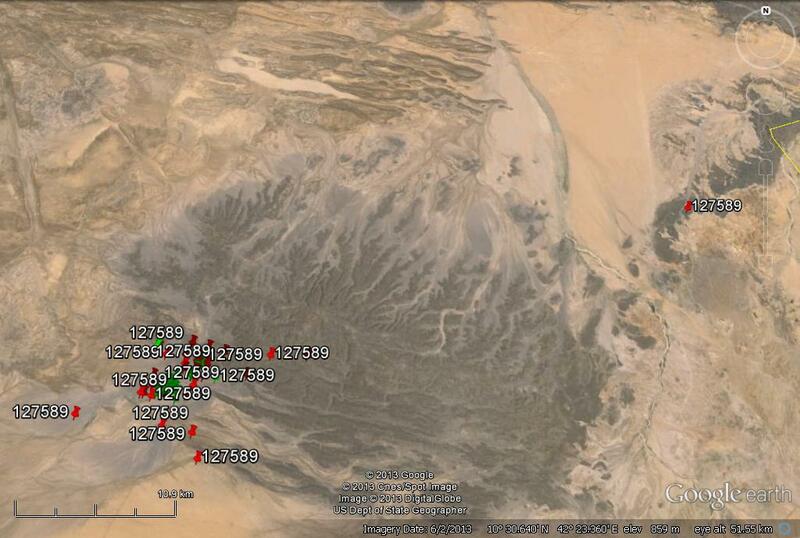 GPS locations of an Egyptian vulture around the town of Adigala, Ethiopia, August 2013. 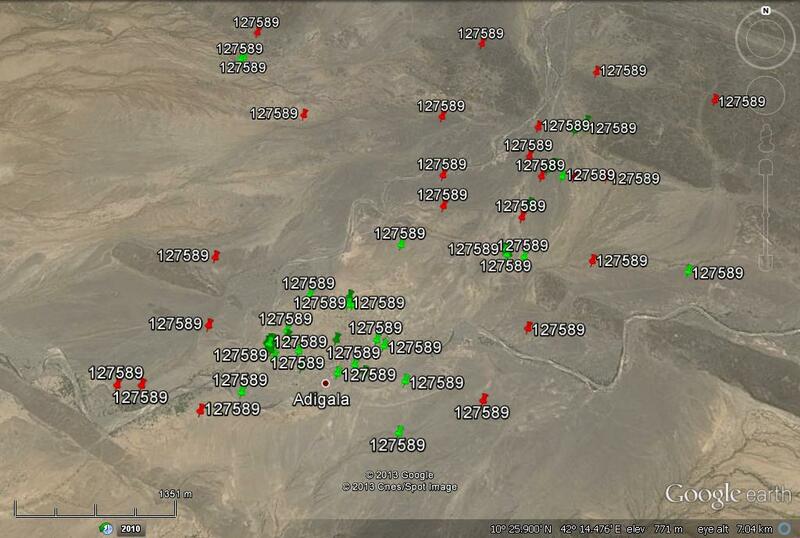 Doppler (red) and GPS (green) locational data for Assamo in early August 2013. You will notice a few features: Doppler locations tend to be dispersed over a wider area. This is because the Doppler system is less accurate than the GPS. You may then ask: "Why collect the Doppler data?" Well the main reason in this case is that the pulse used to calculate the Doppler location is also the means by which the GPS data that are held in the transmitter are transmitted to the satellite and on to us. 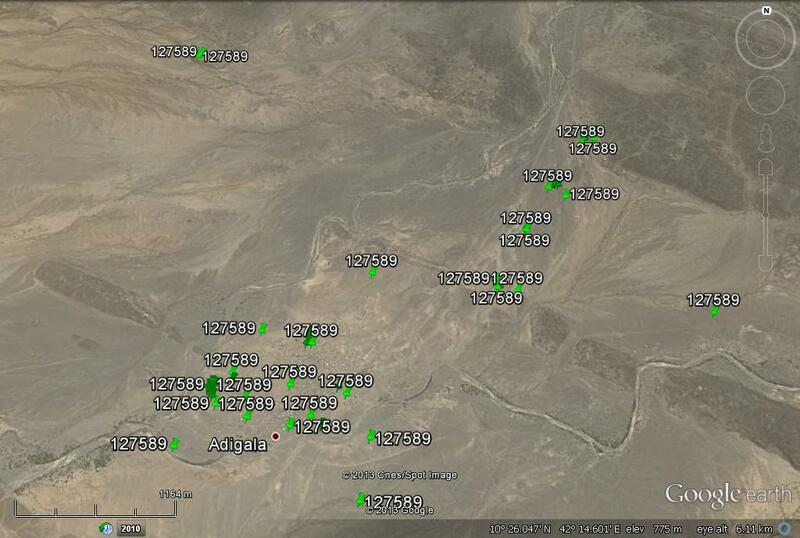 Using the Doppler system to calculate location also has the advantage of using less power. While this is not so important when tracking an Egyptian vulture in Ethiopia because the bird is rather large and the transmitter is solar powered, it can make a difference when one is trying to track a smaller bird or using battery power only. Thus, the really small satellite transmitters used to track things like cuckoos and Amur falcons, etc do not use the GPS system, but rely totally on the Doppler system to calculate bird locations. The use of the transmitter pulse to transmit GPS data also results in many more GPS locations per Doppler location. So, in the case of Assamo, a number of GPS locations will be calculated and stored on board the transmitter, then these will be transmitted via satellite to us, and the pulses used to transmit those data will be used to calculate a "Doppler fix". I have traveled through Adigala by car with my family on my way to Ethiopia's second city, Dire Dawa in July 2011. We stopped there for about 2 hours to have some food. The mosque road is almost parallel to the main road from Djibouti to Dire Dawa, and the area that you indicate is a place where truck drivers gather and where there are a number of restaurants. Mostly the restaurants serve goat and sheep meat, and as a result they generate a lot of waste, including parts from freshly killed animals (intestines, parts of the stomach, lungs, etc...), and the waste from the cooked food. There appears to be little or no organized management of this waste. In conclusion, the preference of Assamo to regularly visit this area of the village may related to the availability of waste from freshly killed animals and the waste of the food from these restaurants. Currently, I have no contact with anyone in Adigala to confirm this information. We will see how Assamo behaves in the coming weeks or months.